My husband has very good taste in jewelry. He has given me pearls and diamonds and emeralds and sapphires. He has educated himself quite well in gemology. He had to approve my new diamond-encrusted wedding band. He doesn’t like cheap stuff. I sometimes think he shops in the same store as Queen Elizabeth. But while he loves to see me decked out (I could go to work in a tiara; he’d been fine with that), he’s a manly man who is content with a good watch and a wedding ring. For our twentieth wedding anniversary, I wanted to give him a present he would love. He spent a week thinking about it. And yesterday was his day. So at breakfast he told me where he wanted to shop. For you girly-girls like me (who had never heard of Cabela’s) – well, it is a Sportmen’s store. But not just any Sportsmen’s store. It’s HUGE, and I hear that there are even much bigger stores in places where there is actually a population of sportsmen. But even the store in genteel Connecticut has fifteen zillion square feet. It has its own aquarium. It has a restaurant. A shooting gallery. Fish electronics. A fudge shop that also carries beef jerky. And every inch of space not taken up by merchandise has some big taxidermied specimen of wildlife – it’s sort of a natural history museum for folks who don’t mind shopping amid dead things. Second floor display of dead stuff - right near the restaurant. Most importantly, Cabela’s has guns. They have big guns, little guns, new guns, used guns. And ammo, ammo, ammo. Yup, that’s what my romantic husband wanted for our anniversary. A new gun. My husband used to be a hunter, but he doesn’t hunt much anymore. Once we moved out into the country and the deer and turkeys became our outdoor pets, he lost his enthusiasm. He is a very tender guy (for a manly man). But he loves to go to the firing range. He likes target practice – and even girly me can see the pleasure in it. I like to get the golf ball within a few dozen yards of a little hole once in a while myself. And he likes explosions very very much. And firing a gun is a little explosion. So off we went to Cabela’s. Little did I know that we would be there for five hours. Even with a permit, it takes an extraordinary amount of time to select, buy, and register a gun. Even if you think you know what you want. I was tempted to remind my husband that he put a quarter in the parking meter when it was my turn to shop. But I didn’t. As I may have told you a time or two (or twenty) already, I am a saint. The first couple of hours were fun. (The last three, not so much). And on the subject of camouflage, it is a miracle you can even find your way through most of the second floor. The aisles could be teeming with marines, and you’d never see them. But I have a question: Why are some hunting clothes orange and some camo? Do you want to be seen or NOT? Well, I made my dear husband extremely happy. I won’t tell you what kind of gun he bought, but suffice it to say you should probably call first before dropping by for a visit. And it stirs my heart to think that every time he squeezes off a round, he’ll be remembering our wonderful wedding day. We have a Cabela’s nearby. I’ve only been there once (not for the light-hearted!). I bought waders to clean my pond but I was stunned by the dead, stuffed animals, guns and general testosterone permeating the place. There were tons of people. I thought it was an amusement park for men. That was two years ago and we haven’t been back. Fortunately, my husband is into tools. He choice would be what I call the Sears Toy Store (Sears has a store here dedicated to tools, paints, yard stuff, etc.) Fun post and keep that quarter token parking in your back pocket. It may come in handy some day. You spent 5 hours in Cabelas??? Wow, that’s true love! So you do practice restraint? Good move. “I was tempted to remind my husband that he put a quarter in the parking meter when it was my turn to shop. But I didn’t.” You are a saint. Ah, Cabelas. The only catalog my husband reads cover to cover. Hmmm. Well. Hubby isn’t a hunter. I can’t imagine 5 hours in Cabelo’s: I agree – you ARE a saint. At least you love your husband enough to let him purchase a gun for your 20th anniversary. That says a lot right there! It certainly shows that I have confidence in our marriage – handing him a weapon. I LOVE that shop. I have only been in one once. It is like going to the zoo without the nasty smells. What a terrific wife to do this for 5 hours though! whew! Your hubbie obviously loves you so he deserves it I suspect! Now “your” song can be Pat Bennitar’s “Hit Me With Your Best Shot.” But not literally. This sounds like a James Bond Movie: Diamonds and Guns! Ha! I only just learned about Cabela’s, probably because I’m out in the boonies now. This post reminded me of your “FIRE!” one. I can definitely see the fun in going to a shooting range, but count me out on the hunting front (unless I’m starving in the woods, and then all bets are off). We’ve actually named our favorite turkeys. They come to the door begging for sunflower seeds. Congratulations. I’ve been in a Cabela’s store…you have very accurately described the testosterone-laden atmosphere. Holy stuffed zebra! We have a Bass Pro shop where I live, but it has nothing on Cabelo. Such a wonderful juxtaposition of what men/what women want. From the exquisite jewelry store..to the hunter’s one. Sounds like a wonderful balance of give and take. Oh, you had figured Connecticut pretty well, guessing golf clubs. But my husband is not exactly typical. Guns and drag racing. I have a Cabelas nearby also. My husband loves that Men’s Disneyland. Once we went and it was daylight and when we left it was pitch black. Happy Anniversary! Happy Anniversary, and keep the ammo and the champagne separate! Funny–when I was reading this post I immediately thought of how your hubby only put a quarter in the meter when you were jewelry ‘hunting’….then you mentioned it too! 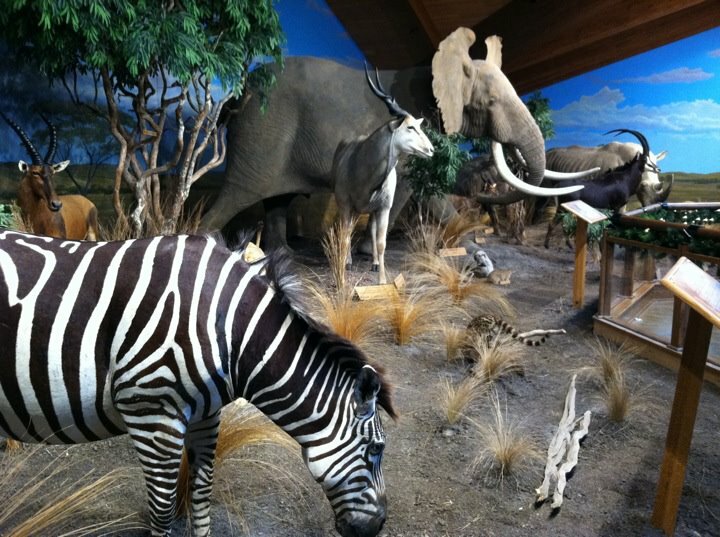 I’ve never heard of the store you camped out in for five hours, but am glad I didn’t have to be with you wandering around all those dead animals…is it even legal to have stuffed zebras and elephants in a store? Only in America, you say….and yes, if I ever have the opportunity to visit you and your hubby I’ll be sure to call ahead and NOT wear anything resembling wildlife. Also, I wanted to let you know that I nominated your blog for a “Liebster Award” today on my site…hope that’s okay. Cheers–and don’t tick your hubby off now that he has his new anniversary present ‘locked and loaded’.